To further my creative ventures in the kitchen, this morning I had the poached pears with mascarpone I made last night. It was way too sweet for breakfast, but sooooo delicious. 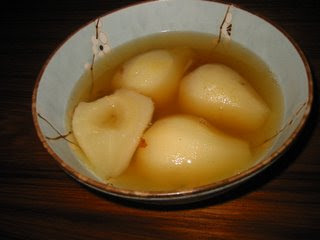 I made a syrup of H20, white wine, vanilla bean, and honey, then poached the pears in it, reduced and chilled it all. The cheese was whipped up with the syrup (after 8 hours of chilling) and a bit more sugar. It was truly amazing, and I was very proud of this success. I wish you could all taste it. This is certainly one to impress. Lou! It looks scrumptious! Will you move to Portland and make me breakfast every morning!? I'll make you dinner and we can fill the time in between with crafty goodness. Yummmm. I love fruit and cheese, any which way! I love, love, love your pumpkin watercolor! Very impressive. You are one talented little chica!! Of course you are welcome here any time...in fact I have your blog over in my sidebar! I've been keeping tabs on you for a while now (ok, like 3 weeks). You have set my heart free. There are many things to think about, but nothing to worry about. 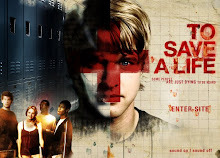 See My Art in the Film, "To Save A Life"
My paintings are on the walls in the house of the party scene! Why "Piggy in the Puddle?" 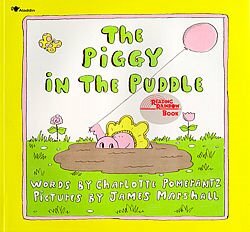 This was my favorite childhood book...it seems to explain my life in some silly metaphorical way since, basically, I am in the thick of it; this is my existence and even if sometimes it's mud I'll make it fun.